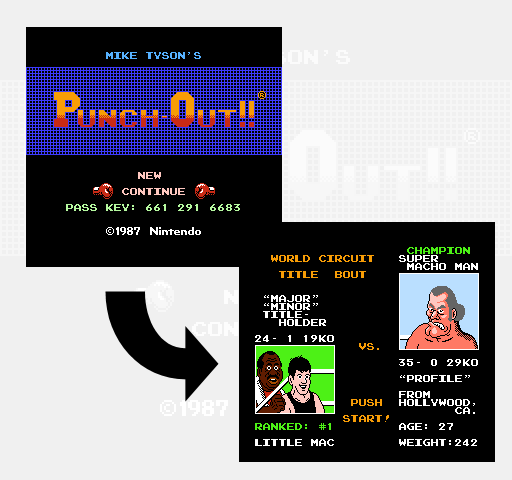 We’ll use an example game with 24 wins, 1 loss, 19 knockouts and starting at the world circuit title fight against Super Macho Man to see how passwords are generated. The process of encoding this game state into a password begins by collecting your number of wins, losses and KOs into a buffer. The game represents each number in binary-coded decimal form with 8 bits per digit and 2 digits for each value. So for our 24 wins, that’s one byte with the value 2, and a second byte with the value 4. Then comes the pair of bytes for the number of losses and one more pair for KOs for a total of 6 bytes of data. The diagram below shows these 6 bytes with their values in both decimal and binary on the bottom. The next step is to generate a checksum over those 6 bytes. The checksum byte is calculated by adding the 6 individual bytes together and then subtracting the result from 255. In our case we have 2 + 4 + 0 + 1 + 1 + 9 = 17 and then 255 – 17 = 238. Next we shuffle some of the bits from the 6 bytes into a new buffer. We can think of the new buffer as a single 28-bit intermediate value that we’ll begin to fill in piece by piece. The bits from the first buffer are split into groups of 2 and moved around to different hard coded positions in the second. This is the first of a few steps whose sole job is to obfuscate the data make it difficult for players to see how passwords are generated. Notice that not all of the bits from the original buffer are transferred into the new intermediate buffer. These bits are ignored because they are known to always be 0. Your number of losses in particular only needs to contribute 2 bits of information to the password because of the rules of the game. If your total number of losses ever gets up to 3, you’ll get a game over and never get a password. Therefore, you only need to be able to represent the numbers 0, 1 and 2 for your number of losses and that requires only 2 bits. The next step is to perform some number of rotations to the left on the intermediate bits. A single leftward rotation means that all of the bits move one place to the left, and the bit that used to be the leftmost bit rotates all the way around to become the new rightmost bit. 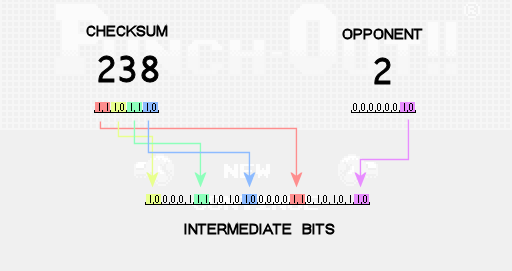 To calculate the number of times we’ll rotate the bits to the left, we take the sum of the opponent value and our number of losses, add 1, and take the remainder of that result divided by 3. In our case we have 2 + 1 + 1 = 4. 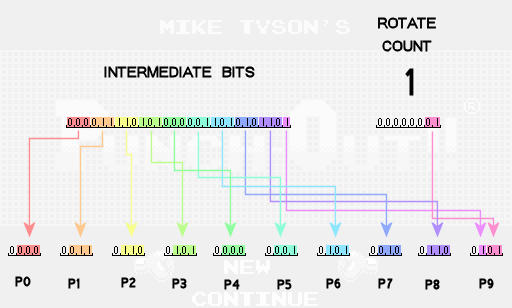 Then the remainder of 4/3 is 1 so we’ll rotate the intermediate bits to the left 1 time. At this point the intermediate bits are thoroughly scrambled and now it’s time to start breaking them apart to come up with the digits that make up our password. Passwords need 10 digits so we’re going to break our 28 intermediate bits into 10 separate numbers that we’ll call password values P0, P1, P2, etc. The first nine password values will get 3 bits of data each, with the final value getting just 1 of the intermediate bits. To round out the final password value, we will also include bits that represent the number of rotations we performed in the previous step. Finally we add a unique hard coded offset to the password value in each position. The final password digit is then the remainder of that sum divided by 10. For example in the seventh position we use an offset of 1, so we have 5 + 1 = 6, and then the final digit will be the remainder of 6/10 which is 6. In the fourth position the offset we use is 7, so we have 5 + 7 = 12, and then the final digit is the remainder of 12/10 which is 2. Now we have the final password digits which we can try out in the game. The process of decoding a password back into the numbers of wins/losses/KOs and the opponent value is a straight forward reversal of all the steps outlined above and is left as an exercise for the reader. There are two notable mistakes however that the game makes when decoding and verifying player supplied passwords. The first mistake happens in the very first step of decoding a password which would be to subtract out the offsets to get back to the password values. The original password values contained 3 bits of data each, which means their values before the offsets were applied must have all been in the range 0-7. However, a player might supply a password that results in a password value of 8 or 9 after the offset is subtracted out (modulo 10.) Instead of rejecting such a password immediately, the game fails to check for this case and instead allows the extra bit of data in the password value to pollute the collection of intermediate bits in such a way that passwords are no longer unique. Because certain intermediate bits could have either been set by the password digit that they correspond to OR the extra bit of a neighboring password value, there are multiple passwords that can now map back to the same set of intermediate bits. This is why you can find different passwords that give you the same in-game result, where as they would have been unique otherwise. 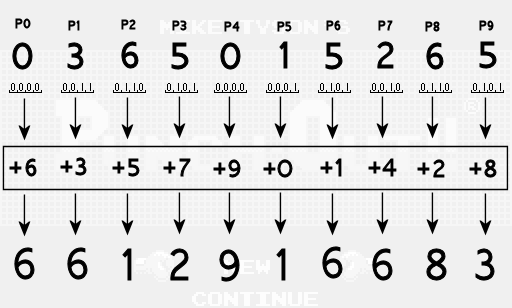 The particular details of this encoding scheme are unique to Punch-Out, but the general idea of taking some important bits of game state, transforming them in a reversible way to obfuscate their relationship to the original game state, and then using them to generate some number of symbols to show to the player as a password is fairly universal. Checksums can be used to make sure that accidental random changes to the password (if your finger slips while entering it) are most likely to result in an invalid password instead of some other password representing a random other game state. 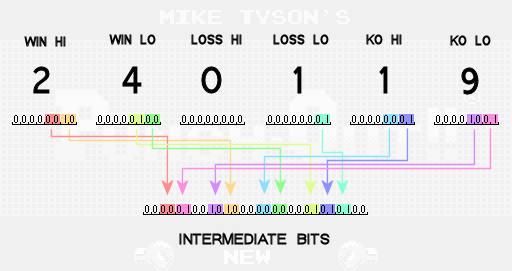 Different combinations of wins, losses, and kos can create the checksum, right? If so, is that fine? Doesn’t that defeat the purpose of checksum? @GK the checksum has to validate the rest of the password, it helps prevent random manipulation of the password. In order for the checksum to validate it would need to be the correct value for those KOs, Ws and Ls. Any given checksum should not validate any given password, it has to be the checksum calculated for that password. It’s safe to assume the average user is not going to be able to generate that checksum by accident or through arbitrary manipulation of the password. Can’t wait to see you tackle Metroid’s password system! Amazing read, seriously loved it!